Cleland born entertainer Sydney Devine positively “rocked” Motherwell’s Civic Centre with an electric 90 minute performance on Friday 20th April. Syd’s I’m Back tour returned him to the bosom of his ain folk for the first time in almost twenty years. The audience, suitably warmed up by the first half acts, always a comedian, a singer and Sydney’s band Legend, awaited with eager anticipation the stage presence of Devine. The arrival of Sydney onto the stage is always heralded by the strains of Also Sprach Zarathustra. As this faded the concert began with “Stop” part of a high octane frenetic paced 10 minute 10 song medley (at least, I lost count). What followed was a glorious repertoire of songs, the number so numerous because of the longevity of Sydney’s career. 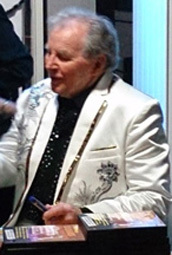 He was a boy entertainer long before he left school and turned professional aged 15, and he is still going strong at 78! A nod to his boyhood stardom came from “If I Were A Blackbird” where Syd both sang and unleashed his wonderful bird song whistling, the thing that got him first noticed. Yodelling came into play as well, along with the “Elvis” style knee trembling. In style there has always been an Elvis type quality about Devine’s delivery, not surprising when he sang The King’s songs as The Tartan Rocker, touring in Europe with The White Heather Group back in the 50s & 60s. At one performance Elvis Presley himself was in the building witnessing the Scotsman on stage. Songs of different tempo and style were included in the playlist, with several characters acknowledged “Maggie”, “Kelly”, “Laura”, “Honky Tonk Angels” and “Fraulein’” to name a few, whilst “Nobody’s Child” was sung as a tribute to The Alexander Brothers. Other titles I recall being performed include-Save The Last Dance For Me; Eighteen Yellow Roses; A Room Full Of Roses; Cryin’ Time; Make The World Go Away; I Fall To Pieces; Married By The Bible; Pretty Woman; Can’t Help Falling In Love; Crystal Chandeliers and Tiny Bubbles. Audience participation always ensures bubbles float over a part of the auditorium when Tiny Bubbles makes an appearance! Oddly one of Sydney’s three stalwart songs didn’t make the cut and that was “Legend In My Time”. Knowing the mournful quality of many songs that Sydney performs, I was aware of the carefully crafted playlist created for the show. Not surprising considering the heartache the Devine family have endured recently, when Sydney and his wife Shirley unexpectedly lost their eldest son Gary aged 58 to sepsis. About an hour into the show Syd slowed the pace with a dedication section, reading out greetings and singing requested songs not already covered. This is where Devine showed his real professionalism, bravely covering most of two songs “The Lightning Express” and “Long Black Veil”, but wisely avoiding the saddest parts. He also used this quieter period to acknowledge his band members and their loyalty to him, particularly Dave on electric guitar 36 years, Dougie slide guitar 42 years and Bill Garden on keyboards 46 years service. Returning to the show again, Syd began a very moving and emotionally charged section for me. I don’t recall him ever singing “How Great Thou Art” (Mammy favourite hymn) and “The Old Rugged Cross” (Granny favourite hymn) together before. It was like the two most influential women in my life, both long gone, were with me enjoying the show. These were followed by “The Answer To Everything” which always gets me. When Syd sings “do you love me, really love me, as I love you” and the audience scream YES, it’s a spiritual experience. Performer and audience share one heart together in those moments, and it never fails to catch my breath. During “The Answer To Everything” Sydney found himself unexpectedly sharing the stage, accompanied by a fan wearing a red cowboy hat. Whilst the Civic staff had been rigidly enforcing their “no photo” policy, this guy had managed to evade their eye, launch himself from his seat and hurtle onto the stage. He threw his arm around Syd, kissed him and was happy to mouth a few words of the song with his idol. Devine looked a bit flustered by this but continued the show seamlessly, although I don’t think the cowboy seen the show finale, which is always “Scotland Forever”. The Motherwell crowd enjoyed one and a half hours of sheer unadulterated entertainment, provided by a 78 year old man who is a performer to his fingertips. His vocal range (3 octaves I think) is still there, deep resonances to high heady notes are still knocked out very pleasantly with gutsy conviction. Proof that Sydney Devine is truly a “Legend In My Time” came to me in Glasgow the day before the concert. Walking around a large department store carrying an overnight bag, I was asked three times if I was visiting. Each time I replied I was up to see a Sydney Devine show in Motherwell. Each woman (from three generations) though not professing to being a fan, gave me a big smile and named a different song-“Eighteen Yellow Roses”, “Crystal Chandeliers” and “Tiny Bubbles”. How many other entertainers can say they have made that kind of indelible imprint on the nations psyche? When the concert finished a throng of people awaited Sydney, all keen to have a word, get a photo or autograph. Every one of them would be met and greeted with humble thanks, charm and good grace. I had a last bus to catch so couldn’t stay, but I managed to grab a photo before leaving. It was a wonderful show, thanks for the memories Sydney, we love you. The story begins with the Hotpoint Aquarius range coming off the production lines in April 2000, that’s the date on the instruction book anyway. Checking the household accounts, our linen-coloured WMA32 model was purchased from the GUS (Great Universal Stores) catalogue in August that year for the cost of £484.89. Hettie Hotpoint-Jackson gave faithful service over the years and continued to do so until her departure yesterday. But signs of late on-set teenage tantrums had been discerned since last September, and my nerves became rather frayed at dealing with them. A younger child would have to be adopted to take up the family laundry business. I knew Hettie’s moods and voice intimately and I noticed a different timbre in her voice last September. She also developed a sudden interest in the art of dancing, initially taking form with a gentle shuffle with some rattling accompaniment. At the end of her performances I was aware her footprint had moved about an inch to the left. I would monitor this new development carefully. Gradually over the months her dancing craze became more animated and laundry days turned into “hug a machine” mode, as frenetic river-dancing took hold. This was partnered by full on percussion of drums and timpani joining in. The orchestration sounded particularly violent at times, followed by a quieter mellower mode when the shuffle dance returned. Every time I switched the machine on my heart was in my mouth wondering if the load would finish, or if the clothes would be stranded in a locked machine drum full of water. As Hettie’s tantrums grew worse I nursed her along with ever smaller loads, using slower spins to ease her pains. Having private insurance I could have had her examined, but last time the doctor was so bolshie, I was put off. And with her age, the prospect of buying a newer model was becoming a better idea, despite the hassle it would cause. So in the meantime I got what needed to be washed done, leaving the winter woollies and the heavy duty sheets and towels, until I had no choice but to tackle them. The pile of winter jumpers turned out easy enough to do; the sheets produced bigger strops and then the towels. OMG!!! Hettie’s Riverdance obsession hit new heights as she spectacularly leapt several inches off the floor, crashing back to earth and four inches from her start position. A full percussion section framed this spectacle. I felt sick and relief flooded me as the wash cycle finally ended. Somehow she had not done irreparable damage to herself and I managed to nurse her for several weeks after this event. But my psyche toward Hettie was damaged, and research really began with a temporary Which Guide subscription arranged in February (although I had mentioned wanting this in November). I narrowed it down eventually to an all singing-dancing (pardon the pun) Bosch, or a reliable nicely programmed Bush model. So this was the backdrop to us taking delivery of our new Bosch machine. His first delivery attempt with disconnect old/connect the new model failed, because Hettie’s connector valves were malfunctioning and the water could not be switched off in any way. The guy wasn’t impressed either when he saw our pipe work and the draining tube going into the sink. So the machine returned to the depot. We would have to get Keele plumbers into fix the connector valves at the very least and preferably connect the new machine too. The inner pipe work eccentricities of our flats mean that only Keele plumbers can fully understand them anyway. Negotiations took place between Rob, Keele and AO.com and a new delivery date was set. It transpired that any outside person would be required to have completed a Keele certified safety course, before undertaking ANY kind of work in the flat! That was news to us, and a complete contrast to the remote off-hand attitude of Staffs Housing Association, who we had to go through before. They just left us to our own devices. Keele are all over us like a rash by comparison, which is good in a way, because our museum piece boiler is always maintained to perfection, we’ve had CO, heat and smoke detectors installed and are checked annually, and new wiring a few years back. So it’s rather nice that Estates care enough now to be hands on, and it gave us someone to approach with our dilemma. Having been flooded at least twice through other peoples’ machines not being connected properly, I can see why Keele are so jumpy now. And as I’ve said, the foibles of the flats infrastructure means that only Keele guys would know how to carry out work, and not flood the place in the process. So the Bosch was delivered Tuesday night and Gareth turned up first thing on Wednesday morning, to fix the connectors and hook the newbie up. My heart sank when even Gareth showed an element of surprise/dismay at the state of our pipes. The upshot was he would have to fix the connectors, seal the hot water one because washing machines tend to be cold fill only now, and it would need to be plumbed in properly. Pipes draining into sinks are a health and safety hazard with contaminated water, which I knew, but we were operating on a lack of support for over twenty years. So the under sink cupboards had to be emptied and then Gareth cheerfully set about his task. He was absolutely brilliant, knowledgeable, quick and efficient. As we chatted he talked of the very hard water wrecking havoc on washers and connectors, and how Keele’s miles of pipe work are a law to themselves. We discussed the merits of machine models (Miele, Samsung, Bosch, Hotpoint) as he will have to replace his own washer soon. On discovering that he had been told Bosch didn’t engineer their machines in Germany anymore but in Britain I quipped, “Well as long as young Beau here doesn’t go all Brexit on me I’ll be happy”. That raised a big smile. When the job was done, our all white Bosch baby was fully plumbed into new under sink pipe work (a bonus) and I patted Hettie goodbye as she was towed away. I haven’t tried the new machine yet, that awaits my return from a trip to Scotland at the weekend. There is a lovely large basket full of sheets and towels to be done, and I’m sure Beau Rex (he is kingly looking, and it’s from T-Rex as he’s a 21st century boy) Bosch-Jackson will do a splendid job. Welcome to your new home my son. Having described some of the trials of “small flat living” in part one, let me put our “chess game” into context. We live in a 1960s built two bedroom rented flat on Keele University campus. By modern standards our living room and main bedroom are quite large, and I thank God on a regular basis for this blessing. The spare bedroom, bathroom and kitchen are compact and bijoux. Nowadays when people move into these rented campus properties the whole infrastructure is renovated, new fitted kitchens, bathrooms, pipes, woodwork, new decor, appliances and windows. With a high turnaround of people, we reckon some flats have effectively been rebuilt multiple times. But when Rob moved into our flat over three decades ago no such renovations took place at all. As a result our kitchen still has the original fitted units and the bathroom, pipes, and woodwork have never been renewed during Rob’s tenancy. Any decorating (with one exception) or appliances have been down to us, and we were the last property to have our wooden framework windows replaced, after multiple invasions of wood ants! As I researched new washing machines I realised the technological abilities of these things had sky rocketed, since we got our last machine 15-18 years ago. The size of them had gone positively “steroidal” as well. I wanted to take as much advantage of these technology advances as I could, but was aware the space for the machine was limited by the location it would NEED to be in, between the gas boiler and kitchen sink unit. So that was a limiting factor in the decision making. I was acutely aware that the new machine would effectively be a 21st century star wars gadget being fitted into an infrastructure from the Apollo 60s era. What could possibly go wrong? A nightmare scenario crossed my mind but I pushed it to one side. Instead I concentrated on the preparation for the newbie, because I knew the flooring would have to be removed. So when Rob was away for his birthday conference I spent four hours lifting vinyl tiles. Who needs a gym? I had hoped my steam cleaner would ease the task but it broke down, so it was a knife, scrubbing brush and mop job. Next day I could hardly walk (squats for 4 hours!) and the kitchen floor without vinyl flooring but with a lovely layer of thick very sticky glue on it. The kind that makes your shoes want to detach from your feet! A Google search led me to using two solvent sprays I had at home (isopropyl alcohol & WD40) with a wallpaper scraper to remove the offending gunk. The floor became so smooth appliances positively “skated” over the surface. At least moving them wouldn’t be a problem anymore. So for the moment the ancient floor covering with paint spatter and speckles of glue remains a work in progress. My nightmare scenario came to fruition when the first delivery attempt of the washing machine was made. Our old machine hot/water connected pipes couldn’t be disconnected because the valves weren’t working to turn the water off. And we can’t switch the water off at all because the task involves a mystery valve behind an access panel in the kitchen. There was nothing for it but take the machine away and bring it back when something could be worked out. My emotions were running high and I just wanted to cry, I had done everything I could think of, and this was totally out of my control. Rob would have to get on the phone next day to Keele Estates/the delivery company and thrash something out. His contribution until now to the buying process was both economic and purely “electronic”, arranging a temporary Which Guide subscription and ordering/purchasing online. He would have to do some negotiating now. During the evening as he pondered an “office issue” I seethed. In my heightened state as some of his comments to the situation seemed “glib” at best, I remembered he had not lifted a single finger at home, spilt one drop of sweat, measured one centimetre, or spent a minute doing research into what to buy. The hard graft in this chess game had all been me. With a new delivery date set for five days later, I decided to move stuff back into the kitchen, and not leave it as Rob suggested. The back room was totally inaccessible and I wanted to work on a project in there over the weekend. With my project successfully completed, I once again moved things in preparation for the arrival of our new Bosch washing machine. Having two machines in the flat overnight was a challenge, and the only extra non kitchen item I needed to move was the narrow bookcase from the hall, which holds our cookbooks. The scene was set for the removal of our faithful Hotpoint machine and the installation of the new Bosch boy. But that’s another tale to be told. Like chess, every square inch of space counts when you live in a flat with a lot of stuff! Each appliance, piece of furniture or gadget has its own special area of residence, and moves within the confines of the flat (the chessboard) with regulated rules. Any game play is always different and circumstances change accordingly, but the rule of play remains the same. So any new piece of furniture/appliance must adhere to the laws of the game. As a couple we have a huge amount of books, cds, a large soft team of stuffed animals, as well as clothes, furniture, musical instruments and appliances to accommodate. With only one small boiler cupboard for storage we have nowhere else to hide things away. So EVERYTHING becomes multi-purpose in use, where wardrobe tops become like attics, and the bottom of them like basements. Drawer unit tops act like extra shelving and cavernous cupboards become storage areas for a melee of objects. Old suitcases store my out of season clothing held in vacuum-bags. These reside in the huge space under the back bedroom bed, specifically bought with that in mind. Memorabilia boxes are under beds too. Any new object of significant size is bought after considerable “brain wattage” has been expended by yours truly. I know the whole process will involve a serious amount of upheaval and physical effort on my part. So I need to feel mentally robust and physically strong before the endurance campaign begins. Last year our old TV with a “back of bus” rear end and a large footprint gave up. We considered having no telly at all, then a small twenty something compact screen that would be unobtrusive. Checking the Argos sales and models available to deliver, we ended up with a 55” curve screen whopper. Thus ensued a back breaking week long realignment and deep clean of the living room to fit the newbie in. We have a distinct lack of plugs in the flat and this was a contributing factor in the rearrange, as well as having enough wall space the TV could be placed up against. In November 2014 asbestos fibre build up was discovered behind access panels in our kitchen. The offending material had been removed from upper flats and the debris from the job had accumulated on the ground floor. We had to move out for a minimum of four days for the cleanup to be done. I had to move most of the stuff from the kitchen and so small gadgets, pots and pans, crockery, cutlery, trolley units and food packs became new ornaments dotted around the flat. Any available space in the back bedroom was consumed completely, and the living room took its share too. When the workmen arrived they said “oh the cooker, fridge and freezer will have to go but the washing machine can stay!” An hour followed of exasperated cursing, scraped knuckles and “iron-woman” hauling. Somehow I manoeuvred the larder fridge into the bedroom where it thought it was a new wardrobe. The freezer took refuge beside the music player in the living room and became a pseudo super woofer speaker. The tabletop cooker and table joined the freezer in the living room and took up a picnic view looking out the expansive window. This state of affairs otherwise known as “organised chaos” continued for nearly three weeks, our time out the flat and our return when the university decorated the kitchen, which needed a good few days to dry out. It was a good job under those circumstances we had a tabletop cooker, our cooking camp already in place in the living room. When everything was returned to the kitchen and new flooring (sticky backed vinyl tiles) eventually put down the renovation job was complete. My long held suspicion the floor wasn’t exactly level was confirmed whilst laying the floor tiles. This would prove problematic in the future. Our annual gas boiler check requires the removal of kitchen stuff and the reposition of the larder fridge, to ensure unrestricted easy access. Such projects and general foot traffic showed up the shortfalls of the vinyl tiling. At various points individual sections were replaced when damaged. But with the realisation a new washing machine would have to be bought, the floor issue and everything else regarding small home living would come home to roost. I knew a lot of thought, planning, research, physical effort and upheaval would be required. Over a number of months I psyched myself up for the ordeal. The whole process has been an emotional battering ram, and as I awaited the delivery (2nd attempt) of the washing machine, I realised there was nothing left in me. Mentally I was worn out, physically shattered and emotionally drained.